A new survey by London-based Coeus Consulting reveals that 88 percent of respondents are unable to demonstrate cost transparency to the rest of the organization. Those that can, however, are best positioned to deliver business agility for digital transformation and are more likely to be represented at senior level in their companies. What the study identifies as 'cost-transparency leaders' are twice as likely to be represented at board level (100 percent versus 54 percent). They are also more likely to be involved in setting business strategy (85 percent against 55 percent), twice as likely to report that the business values IT's advice (100 percent versus 52 percent), twice as likely to demonstrate alignment with the business (90 percent vs 50 percent), and more than seven times as likely to link IT performance to genuine business outcomes (38 percent vs five percent). Among other findings is that 58 percent of IT leaders surveyed are scenario planning for Brexit. But two out of five are not confident they will be able to meet challenges associated with it. "This survey clearly reveals that cost transparency is a prerequisite for IT leaders with aspirations of being a strategic partner to the business," says James Cockroft, director at Coeus Consulting. "Those that get it right are better able to transform the perception of IT from 'cost center' to 'value center' and support the constant demand for business agility that is typical of the modern, digital organization. Only those that have achieved cost transparency in their IT operations will be able to deal effectively with external challenges such as Brexit and GDPR." 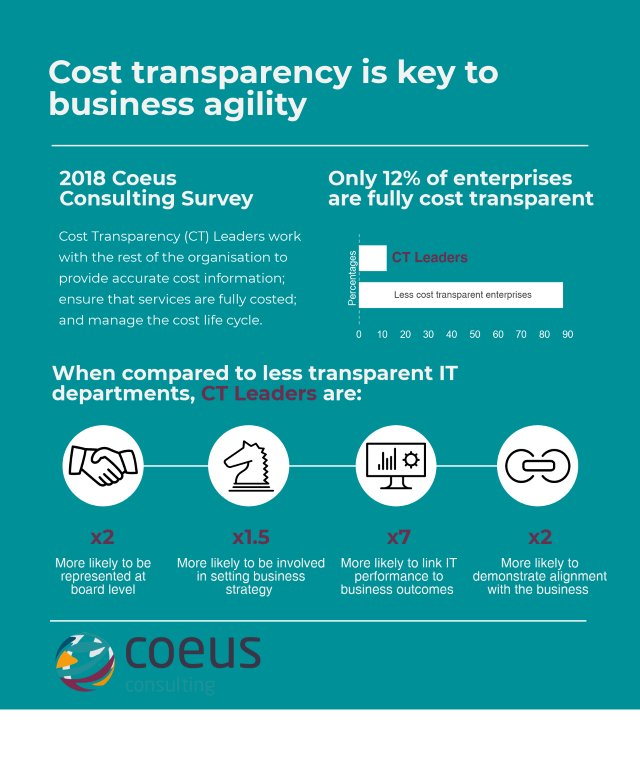 You can find out more about why cost transparency in IT is key to delivering business agility in the full report, available from the Coeus website. There's also a summary of the key findings in the infographic below.